Video clip synopsis – The Xpression portrays a Vietnamese family migrating to Australia. It illustrates the differences of location, environment and culture. Broadband MP4 vietjourney_bb.mp4 (6.0MB), suitable for iPods and computer downloads. This Xpression is based on identifying cultural articles significant to Vietnamese culture. 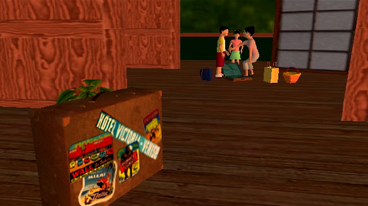 It focuses on a suitcase and its contents belonging to a Vietnamese family migrating to Australia from their village in Vietnam. When they arrive, the family unpacks their suitcase to reveal special family images and objects they want to remember and that are significant to them. The Australian Children’s Television Foundation created the educational 3-D animation program Kahootz to be used in schools by primary and lower secondary students across a range of key learning areas. The animation program gives children the power to create complex narratives, blue/green screen movies, puzzles, games and presentations in a three dimensional world. Kahootz 3.0 allows students to easily create, explore and invent in 3-D environments with pre-made worlds and objects. Children aged 7-15 can create amazing 3-D scenes combining Kahootz characters, animals and buildings with enhanced animation, soundtracks, their own voice-over and special visual effects. Kahootz 3.0 enhances creativity, critical thinking and problem-solving whilst engaging students to demonstrate their skills and knowledge of ICTs. Viewing this Xpression will assist students to understand Asia, to develop informed attitudes and values, to know about contemporary Asia, and to connect Australia and Vietnam (refer to National Statement for Engaging Students with the Studies of Asia). Research what would life be like in a Vietnamese village and what treasured possessions a family might bring with them. Demonstrate different cultural settings using Kahootz tools. Be able to use translation tools from the Internet. Design what elements are required for each scene and how each they transition to the next. Plan by using a storyboard, share ideas with others in the class. Experiment and practice using Kahootz to develop skills with the menu and functions. Use Kahootz sounds, animation, swatching, keypointing, lighting effects and fog. Present and explain your finished Xpression to others in the class. Upload your finished Kahootz Xpression to your school’s Kahootz webpage.